Professional Drifter Vaughn Gittin Jr. has revealed his 2015 Mustang RTR at the AmericanMuscle Car Show. The crowd at the AmericanMuscle Car show was excited from the beginning to meet Vaughn Gittin Jr, but there was the added bonus of him introducing his 2015 Mustang RTR to really set the crowd off! Vaughn has earned himself a position of respect and admiration within the Mustang community for his victories in the drifting world with his Mustang as well as his RTR line for the Ford Mustang. “Ready to Rock,” better known as RTR, is Vaughn’s vision of the Mustang and has been a huge success within the Mustang World. Dating back to the 2010 model year, the Mustang RTR has offered Mustang Enthusiasts a more personalized Mustang Experience, with increased track performance and more aggressive styling than the stock Mustang. The 2015 Mustang RTR has positioned itself to be a continuation of the spirit that is the RTR identity. Now benefiting from the S550 Platform, the 2015 Mustang RTR will be available in Spec 1 and Spec 2 trim, offering different levels of performance to owners. The 2015 Mustang RTR will be available with either the 2.3L EcoBoost engine sporting over 300 HP or the tried and true 5.0L coyote engine putting down 435 HP this January at select dealers that can be located on mustangrtr.com. Non-RTR 2015 Mustang owners will not be left out since they can take advantage of customizing their Mustang with parts from the RTR collection which will be available in January as well; 2010 – 2014 Mustang RTR parts are available now. 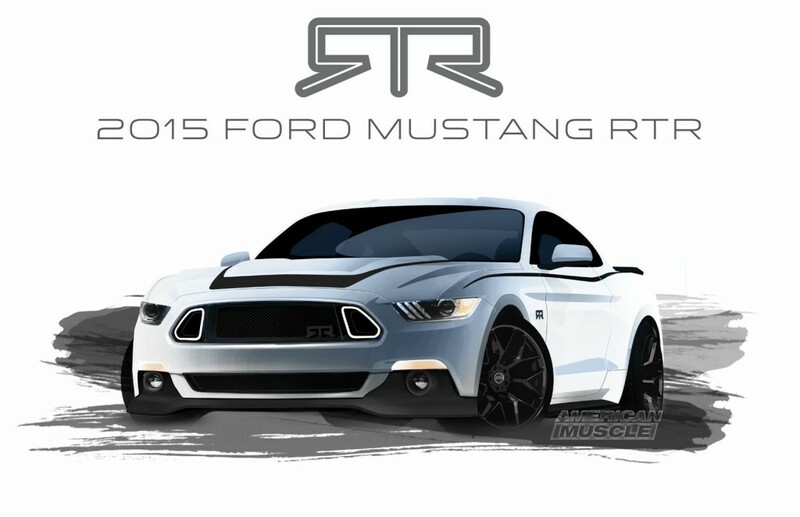 As with previous RTR models, the 2015 Mustang RTR will continue to have its one-off appearance. The signature front chin spoiler with the hood stripes provide an intimadating presence, while the rear diffuser, decklid panel, and wing leave Camaro owners with an amazing view of the 2015 Mustang Taillights. The whole exterior package is tied together with the unmistakable RTR wheels that put the power of the 2015 Mustang to the ground. The 2015 RTR also benefits from RTR suspension tuning with adjustable dampers and adjustable sway bars that give this Mustang a dominating track presence or a noticeable street presence. The AmericanMuscle Car Show brought the largest crowd to date, with proceeds benefiting the Special Olympics. Vaughn’s revel of the 2015 Mustang RTR rendering was a major highlight of the show, resulting in many of those in attendance to pose for a picture with the RTR design and get an autograph from Vaughn himself. Vaughn Gittin Jr’s influence on the Mustang World is tangible through the RTR brand, with the 2015 Mustang RTR being the best example of how well revered he and his line is. Vaughn’s passion for the Mustang as well as all-out-performance knows no bounds and only continues to expand, bettering the Mustang and the experience one can have with Ford’s legendary car. Be sure to follow the 2015 RTR with the #2015RTR hashtag on social media. Next Entry Drive the 2015 Mustang in Forza 5! Awesome car! Love it! Can’t wait to get my hands on a 2015 stang!!! 2014 mustang show was amazing yesterday drove 4 hours well worth the trip thanks american muscle!!!! Haha think you made a spelling error in 5th paragraph says 2105 instead of 2015!! Rock on !!!! Awesome to hear you enjoyed the show Saturday! A lot of time and effort was put into planing it this year so it’s nice to see it paid off.